Inducing advanced, blood-engorged Hyperemia Muscle Pumps takes precision. The uniquely potent, athletics-enhancing formula in NITRAFLEX PUMP! Its clinically defined dosage matrix of L-Citrulline, Hydromax Glycerol, L-Norvaline, and Pine Bark boosts nitric oxide, dilates blood vessels for higher volume flow racing into muscles fights fatigue. It increases pumps and endurance. Agmatine Sulfate adds Nitric Oxide synthesis, muscle growth, and recovery. Feel the power of NITRAFLEX PUMP, and crush workouts with seething intensity. You won’t believe it’s stim-free! 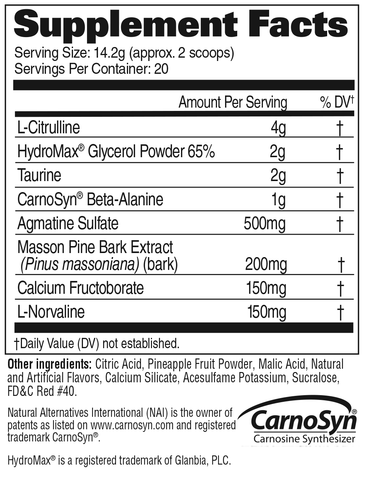 Carnosyn® Beta-Alanine enhances muscle’s hydrogen (H+) ion buffering. Agmatine increases energy for heightened performance. L-Taurine increases alertness, strengthens the heart and reduces blood pressure. NITRAFLEX PUMP is truly a power-packed pre-workout pump matrix for today’s athletes! Original NITRAFLEX by GAT Sport dominates pre-workout. Its proven performance has fueled thousands of fitness enthusiasts and Pro athletes worldwide. Now, the power of NITRAFLEX is also in new STIM-FREE NITRAFLEX PUMP! 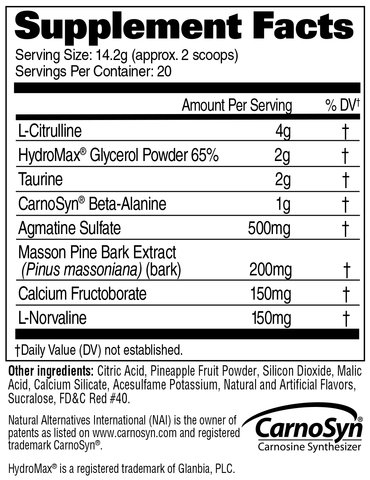 Other Ingredients: Silicon Dioxide, Citric Acid, Pineapple Fruit Powder, Malic Acid, Natural and Artificial Flavors, Calcium Silicate, Acesulfame Potassium, Sucralose, FD&C Red #40. Mix 1 serving (2 scoops) of NITRAFLEX® PUMP with 10-12 oz of cold water and consume within 30 minutes before working out. Can take up to two servings daily.